“The family had come from Iraq with very high hopes, but the situation of the girl was very unusual, it was a kind of medical challenge for us. Obviously, a reconstruction surgery was her only treatment, but what she required was one of the rarest surgeries. The procedure she underwent involved osteotomies, where a bone is cut to change its alignment or length. The old nose bones had to be broken and a new nose is constructed, also, the skull bones had to be cut to reshape. 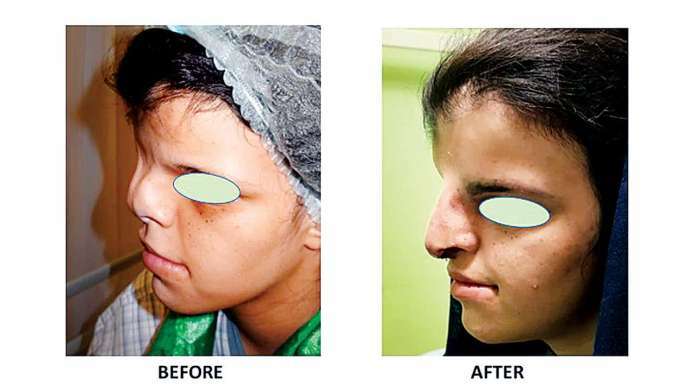 To reshape bones around her nose and eyes we did osteotomies of the skull bones and bones around the eyes, and to reconstruct the nose at the mid-line, we had to use the rib graft,” said Dr Ajaya Kashyap, Medical Director, KAS Medical Centre. While the condition was not giving Benafsha any serious health complications, appearing different from others was doing no good to her mental health, shared her family. Apart from low self-esteem, complex, and dejection had crept in her personality. Her family wanted to help her look normal and get rid of the de-shape, thus she was brought to India. Post surgery Benafsha is doing fine and looking forward to going back to school. “When we started off from Iraq all we hoped was to help our daughter with her sadness. But what we actually received here is beyond expectations. For the first time, we saw our daughter so happy. For us, the surgery has changed everything. Now we can help our daughter settle in her life in whichever way she wants, without feeling insecure about her looks,” said Benafsha’s father.